Illus. in full color. 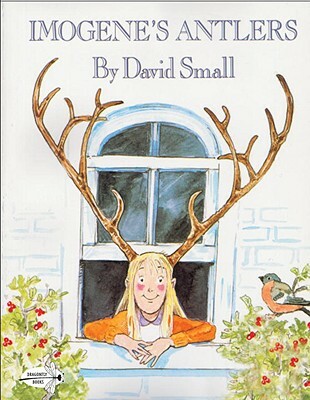 Imogene awakens one morning to find she has grown antlers. David Small grew up in Detroit, Michigan, studied art and English at Wayne State University, and completed his graduate studies in art at Yale University. In addition to children's books, David makes editorial drawings for such publications asThe New York Timesand The Wall Street Journaland is a frequent contributor to many national magazines as well. David also writes book reviews for The New York Times Book Review. Although David always dreamed of being an artist, it was not until he was in his late thirties and had several works published that he began to say, proudly, I am an artist. David and his wife, Sarah Stewart, now live in Mendon, Michigan, a town so small that you can whisper something on one side and be heard on the other. "Small maximizes the inherent humor of the absurd situation. Hilarious, with a subtle lesson in acceptance." --(starred) School Library Journal.